Suitable for the smaller 10-25mm Dinse type panel sockets which have an internal diameter of approximately 9mm. 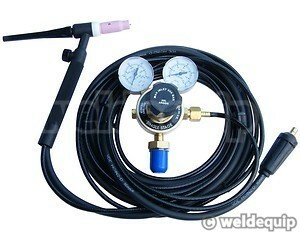 This set allows you to convert your DC Inverter Arc welder to a scratch-start TIG machine. Simply connect the TIG torch to the negative (-) socket on the front panel of your machine and the gas regulator to a suitable Argon gas supply, and you will be up and running for basic TIG welding. The TIG torch has a gas valve on the handle to manually turn the gas supply on and off, and a 1.2 metre gas hose to connect to the gas regulator on your Argon gas cylinder. You will need a supply of pure Argon gas. The gas regulator supplied is standard fitting for all sizes of refillable gas cylinder, from portable to full size industrial (excluding Air Products "Integra" cylinders). Quality, UK made 150 Amps DC rated torch fitted up ready to weld with front end torch parts & tungsten electrode. Top quality British made gas regulator with cylinder contents pressure gauge and output pressure gauge calibrated in litres per minute (LPM) for accurate flow control. These sets will convert most electronic DC Inverter Arc machines to TIG and also DC Rectifier type machines, but are not suitable for converting standard AC transformer type Arc welders to TIG.